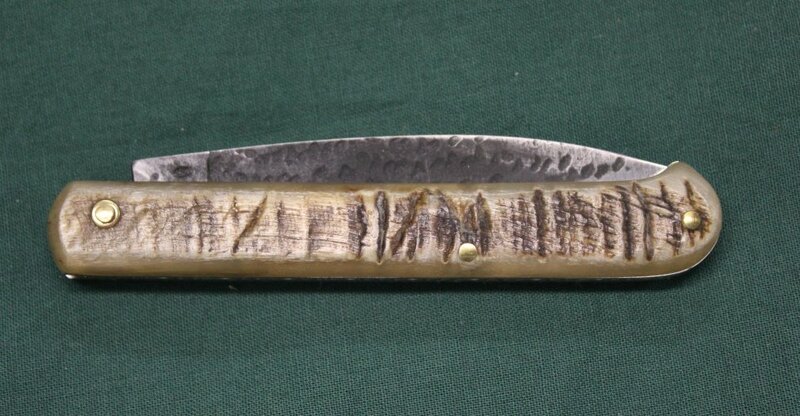 This one is 3½" closed with two blades. Handle is bone with brass pins. Nice 19th century style. Many of these have been found on Civil War camp and battlefield sites. This is a nicely made inexpensive folder to put in your pocket or shooting bag. Walnut handle and a strong back spring. Measures 4¼" folded. Blade is 3½". I keep one in my pocket all day and use it around the shop. My best seller. 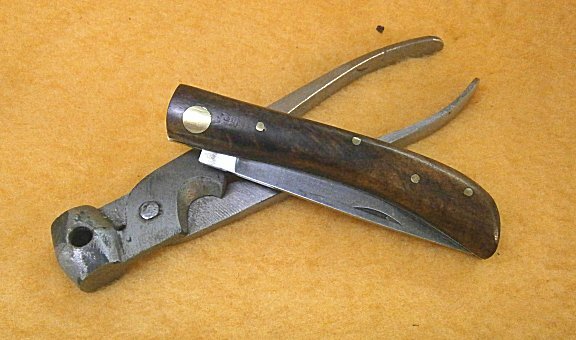 This is also very similar to a pre-WW2 German pocket knife. The curved blade on this knife is not only good for pruning but makes an excellent patch knife to keep in your shooting bag. Has bone scales and a nice stiff back spring. Measures 4" closed and has a 2¾" blade. Nice little knife for cutting fruit and has a fork as well so your hands don't get sticky. That will impress your wife. These are well made modern versions of an early 17th century style. Made with stainless blades in a satin finish. The steel bolsters have a satin finish as well. Handles are wood with brass pins. Small one is 4" closed with a 3" blade. 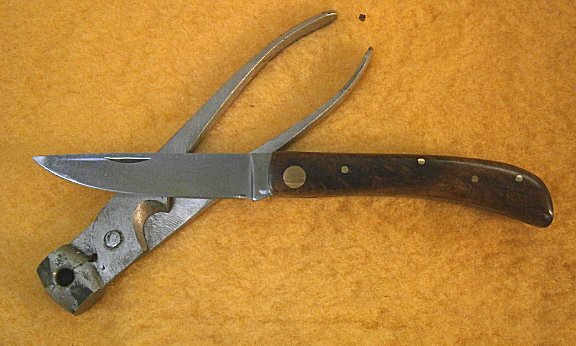 Large one is 5" closed with a 3¾" blade. 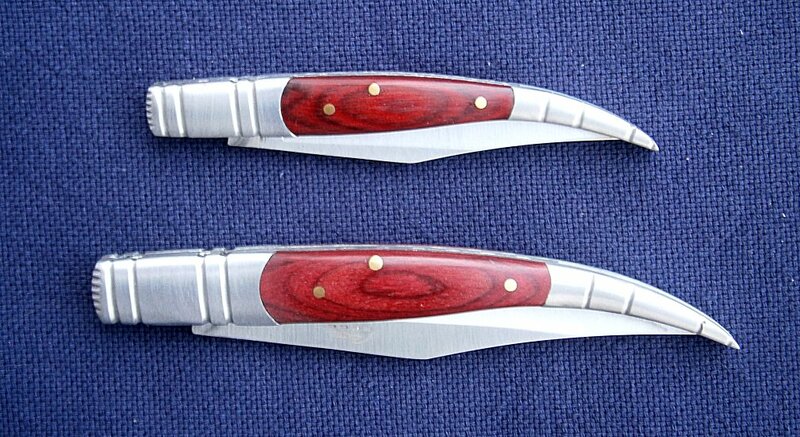 These are well made copies of a common 18th century style knife. Many originals survive today and many have been dug up at various Rev War period sites. Your choice of bone or black horn handles. Measure 8¼" open and the blade is 3¾" long. All have brass bolsters and pins. Also known as a Peasant Knife and the style goes back to the mid 1600s. These are copied from an original piece and made right here in Williamsburg. These were sold in most stores in America from the late 17th to early 19th century. Handles are various hardwoods (walnut, maple, cherry etc.) Blades are made from heat treated carbon steel and are 3¼" long. Overall length open is 7½", folded 4¼". Sorry, no choice on handle material. 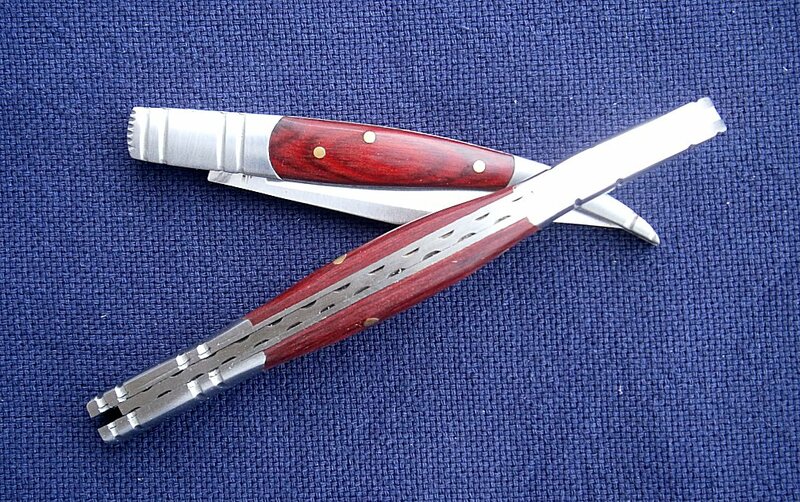 These are very nice high quality folders that have real ram's horn scales and high carbon steel blades. The blades have 'hammer marks' left on the blade and the edge has been polished and sharpened. They have a stout back spring with nice file work. 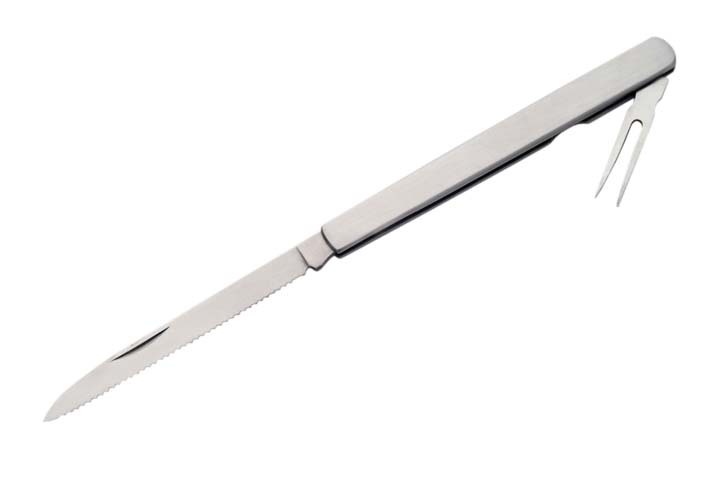 The blade has a 3½" cutting edge and the handle is 4¼" long. One of my best sellers. 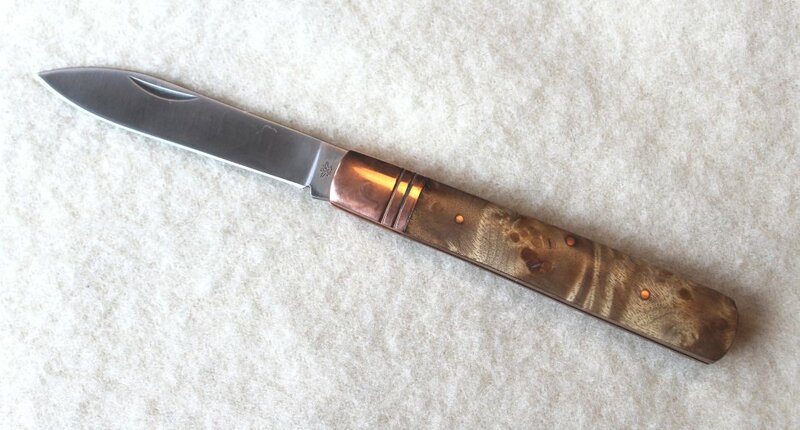 These are very nice high quality folders that have burl wood scales with copper bolsters and liners. No two will be alike due to the nature of the wood. 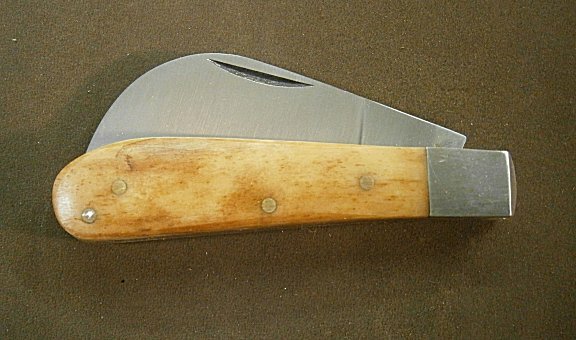 The blade is 3½" and the handle is 4¼" long.